An Ontario, Canada, witness at Burlington reported watching a large, V-shaped UFO that was first thought to be a building – until it moved about 9:40 p.m. on August 10, 2014, according to testimony in Case 58833 from the Mutual UFO Network (MUFON) witness reporting database. The witness was driving to a friend’s house when bright red and white lights were first seen. “I thought it was a structure’s lights until it started moving and I stopped my car,” the witness stated. 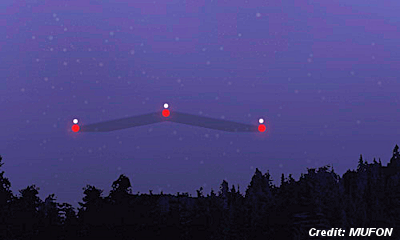 “It was a wide/long, V-shaped object with two lights at each point, two on the outer wings and one in the middle. Each light was red with a smaller white light atop. Initially I thought it was a building until it started moving.” . . .
MY UFO EXPERIENCE: "It Was Gigantic! Twice The Size of a Football Field, Bigger Than An Aircraft Carrier!! !